The test is available for use on 30 commodities, providing the most comprehensive screening test available for the feed and grain industry. 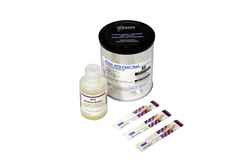 Today, Charm Sciences announced the company was awarded a Certificate of Conformance from the United States Department of Agriculture – Federal Grain Inspection Service (USDA-FGIS) for the ROSA® FAST Aflatoxin Quantitative Test (AFQ-FAST). Established in 1978 in Greater Boston, Charm Sciences helps protect consumers, manufacturers, and global brands from a variety of issues through the development of food safety, water quality, and environmental diagnostics tests and equipment. Selling directly and through its network of distributors, Charm’s products serve the dairy, feed and grain, food and beverage, water, healthcare, environmental, and industrial markets in more than 100 countries around the globe.